Just when you thought the zombies, exorcists and ballerina babies from last week's premiere had made So You Think You Can just about as weird as it could be, Nigel and company wheeled out all the freaks and maniacs the West Coast had to offer during last night's Los Angeles auditions. Waackers, circus performers, pole dancers, tapping surfers and, of course, Ninja Twins graced the stage in hopes of getting a ticket to Vegas from Nigel, Mary and guest judge Jesse Tyler Ferguson. Naturally, most of the bizarre acts didn't produce awe-inspiring auditions, but there was still a fairly good showing out in Hollywood. I'm still disappointed in the lack of ballroom dancers—we got one 15-second clip last night out of a 2-hour show—but hopefully the coming weeks of auditions will cure that. Right now we've been looking at a whole lot of female contemporary dancers, and that is just not going to cut it once we hit the Top 20. And, yes, I realize that ballroom dancers have been mistreated on the show as of late with contemporary girls taking the charge, but c'mon! I wanna see some rhumba hips on my screen! Narrowing down my favorite auditions of the night was an interesting balance between actual talent and pure entertainment. Stephen Jacobsen turned out to be a phenomenal ballet dancer, but his half-assed and pompous audition left me with a sour taste in my mouth and him off the list. The opposite was true for the fabulous Ninja Twins: they made me cackle on the couch, but the end result audition wasn't exactly noteworthy enough to land them here. 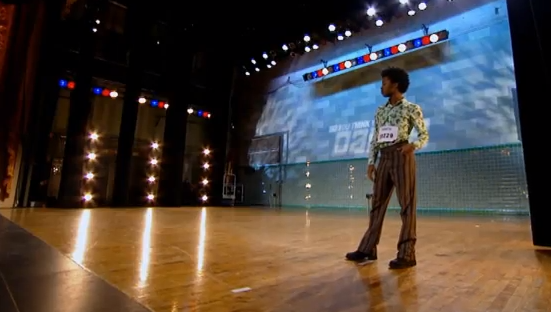 I'm not necessarily talking about the best dancers here, just my favorite auditions. Okay, so Johnny Waacks is certainly no Baryshnikov—or Princess Lockeroo, for that matter—but that boy hit every single note with attitude and energy. I honestly think that if he worked on his basic dancing skills—getting those attitudes up, point all the through during the pirouettes—he could go far on the show. His total commitment to the choreography and his embrace of the fabulous 70s music made him one of my favorites of the night. I can't be the only one who got a little nervous during Eliana's pole dancer introduction, right? Fortunately, the pole stayed at home when she auditioned and were replaced by her stunning flexibility and ability to transition instantly from sharp staccato movements to gorgeous fluid motion. The judges praised her as one of the best girls yet, and I can't wait to see more of her in Vegas and beyond. No gimmicks, no fuss. Megan Branch is just a phenomenal dancer. She attacked her audition piece with fiery aggression while still maintaining a beautiful softness that made the whole thing just so damn fabulous. Snaps all around! What happened to Jasmine and her brother Marshea Kidd was both horrific and amazing—that they survived that terrible crash and were able to dance six weeks later is truly remarkable—but let's not kid ourselves for one second here. Without the sad story, Jasmine is still an unbelievable dancer and a force to be reckoned with in the weeks to come. And, fine, the fabulous hair helped. So, all in all, a solid round of auditions in LA. I'm not sure I'd call it the "strongest showing" like the promos suggested, but I'm still optimistic about this crop of dancers so far. What did you think? Still hyped on Season 9? Sad the Ninja Twins were over the age limit? Or still wondering what the hell Stephen Jacobsen was thinking with that audition? Sound off in the comments!